LANCASTER, PA, USA, October 15, 2018 /EINPresswire.com/ — VIZpin, designer and manufacturer of the VIZpin smartphone-based, Bluetooth enabled access entry system, has launched the first solar powered, cloud-based smartphone access control system. Because of increasing demand for managing access to remote areas where power is limited or cost prohibitive, VIZpin developed the VIZpin Solar Kit. 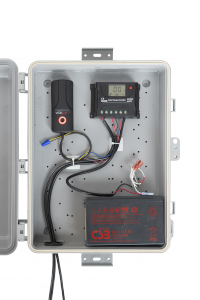 It is self-contained in an environmental enclosure and comes with a gate/door controller and long-range Bluetooth Reader that works with any standard electric door strike or electric latch. It also includes a solar panel, battery, charge controller and mounting hardware. 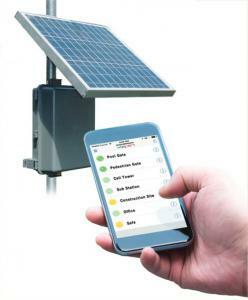 The VIZpin Solar Kit is very easy to install and doesn’t require power. It can be managed from anywhere without needing a local network connection or modem. It works with any iOS or Android Smartphone and comes with five Smartphone Keys. Additional keys may be purchased. “Initially we developed the VIZpin Solar Kit for pool and pedestrian gates, where property owners wanted to control access remotely but couldn’t afford the $3,000 price tag that comes with a hardwired system,” said Paul Bodell, VIZpin president and CEO. “Because of the low cost and ease of installation of the Solar Kit, we are now seeing applications at cell tower and utility sites, storage sheds and modular offices”. 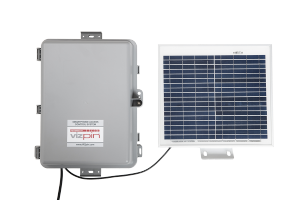 The VIZpin Solar Kit will power a typical 12VDC lock or latch continuously on less than three hours of sun each day or for four days with no sunlight. It retails for $699 and can be purchased through a VIZpin Certified Partner or directly from VIZpin.